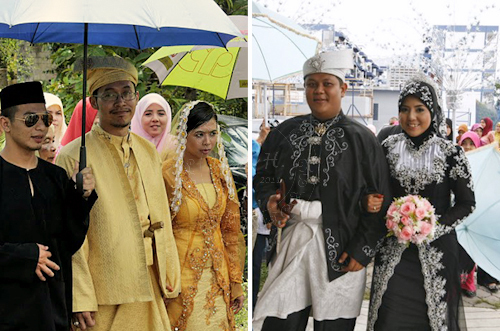 In villages or kampongs... Malay weddings are celebrated as a community activity. Relatives and neighbours would get together to help out in the preparations, cooking, serving as well as cleaning up after the big event. Men are assign with back-breaking task such as chopping fire woods, put up tents, arrange tables and chairs while ladies help out in peeling onions, removing rice husks from the rice grains, clean and cut-up chickens and kilos of beef, boil hundreds of eggs, make litres of syrup. Big woks and pots are put to good use. Frying and sautéing would be done on the eve.. with major cooking are done early in the morning on the wedding day. Left ~ a beautiful diamond ring for the bride. ﻿Finally... when everyone done feasting and chatting... the host would present us with their token of appreciation by handing out 'BungaTelur' ~ a nicely presented hard boiled egg wrapped in a beautiful sachet filled with 'Bunga Rampai' (Bunga Rampai is made out of semi dried finely sliced screwpine leaves mix with rose petals and few drops of rose water.. its the Eastern 'Pot-Pourri'). Last but not least.... I am submitting this to Sharon of Test with Skewer for her Muhibbah Malaysian Monday. Wrap fennel seeds, star anise, cloves and cinnamon in muslin cloth. Secure with cooking string. 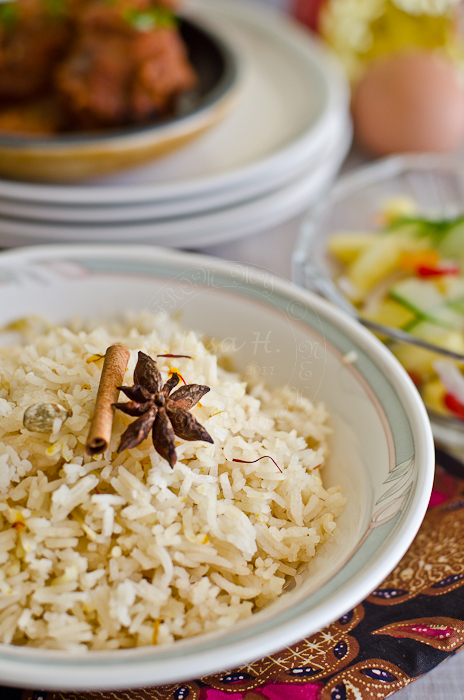 Place the rice in Rice Cooker with the knotted screwpine leaves and Bouquet Garni. Heat up pan and melt the ghee. Saute cardamon and shallots until fragrant. Add evaporated milk, water and season with salt. Gently pour the mixture in the rice cooker. Add saffron on few spots on the 'about to cook' rice (approximate10 minutes before the rice is done) for the 'yellow' tinge. Gently fluff up the rice. Nasi minyak.... yum yum my favorite. Anyway, after reading the recipe, it's a family of nasi minyak in Medan and Aceh. What do you call for ghee in Malaysia? We call it minyak samin. 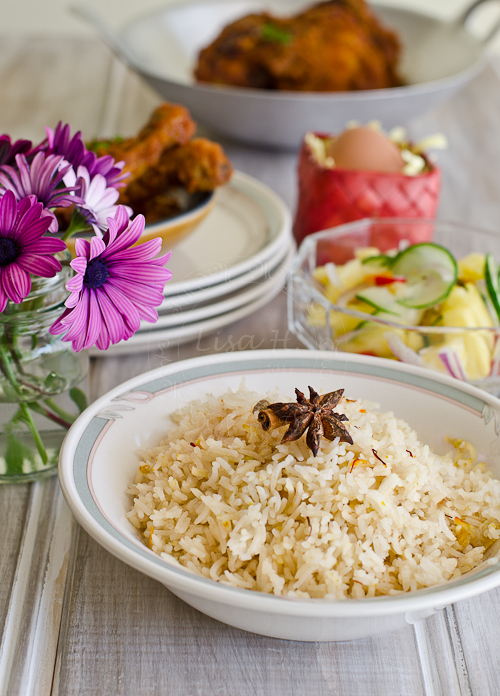 A great rice dish! Delightfully fragrant. 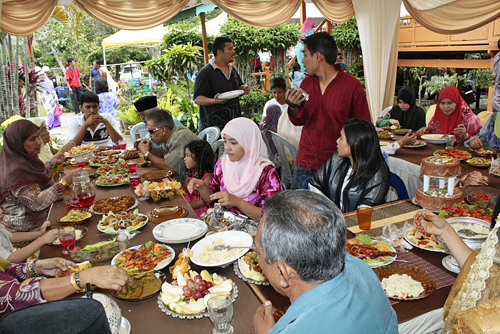 I miss the kenduri back home! So much to eat and see! This post certainly brought back memories. The last time I attnded a wedding like the one pictured was when I was a kid. Your nasi minyak looks fantastic...drooling! I have my curiousity with that minyak rice as it appears so palatable. I'm gonna try it this weekend. Hi Lisa! Wow, this is the traditional wedding! Thanks for sharing and educating us about the wedding. Your nieces are gorgeous. I love their matching color attire. And I'm surprised by the flowers. SO MANY, even in bedroom! The Nasi Minyak looks delicious. I love rice and I know this is really addicting to eat with the chicken too... I look forward to visit Malaysia one day. This is a beautiful recipe, simple and healthy and would be great to accompany spicy curries too! 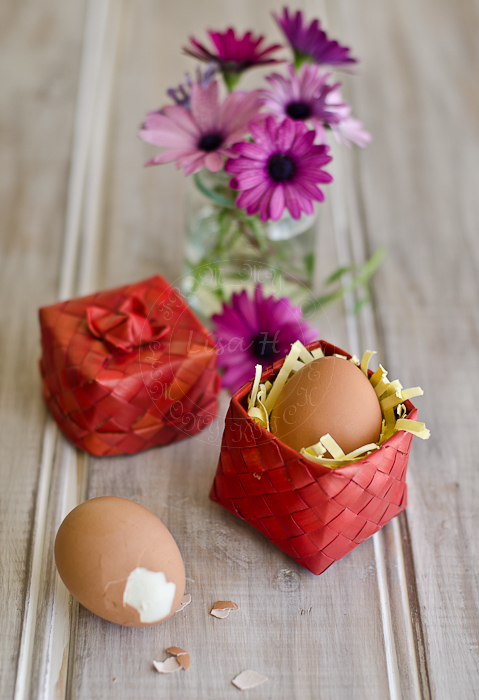 I just ended up on your blog through a French food blog and I love it!! I'm a huge fan of Malaysia and Malaysian food ;-) and I was desperate to find easy recipes I could do myself. I miss this food so much! I just suscribed and I'll hope you'll keep on feeding it on a regular basis! A French girl in Paris, missing hot and cheering food in a cold sunny winter day!